Fourth Row Center: Film Writings by Jason Bailey: On DVD: "Moonshot"
The History Channel is known for a lot of things--their documentary programming, their not-quite-historical reality shows, their (ahem) considerable interest in Hitler--but they're not the first spot on the dial you think of for original films. 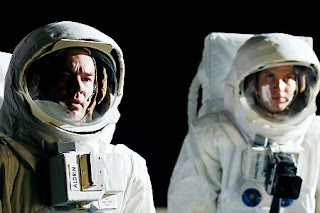 However, the network chose to commemorate the 40th anniversary of the Apollo 11 moon landing by airing a made-for-TV docudrama about the landing, Moonshot. The story begins on launch day, July 16, 1969, as Neil Armstrong (Daniel Lapaine), Michael Collins (Andrew Lincoln), and "Buzz" Aldrin (James Marsters) begin the historic mission. It then bounces back to 1962, and the announcement by President Kennedy of the country's pledge "to go to the moon in this decade and do to the other things, not because they are easy, but because they are hard." The storytelling of Tony Basgallop's screenplay is a tad compressed (but what the hell, it runs 90 minutes--if you want scope, go watch From the Earth to the Moon), but effective; we meet the three men and their families, track the development of the crews and the technology (Lincoln has a funny scene trying out the urinary apparatus), and get a sense of the genuine danger of their work. The sparse, intelligent handling of the Apollo I disaster is particularly well-done, as is the battle over which man (Armstrong or Aldrin) would be the first on the surface. The subsequent tension over that decision isn't terribly subtle, but it is intriguing, and in that area of real human interest, the performances come to life. The two men share a quiet, reflective back porch scene early in the film that sets the table nicely, and allows us to study the contrasts in their personalities. Lapaine's Armstrong is a bit of a blank slate, but that's as it should be. Marsters, best-known as bottle-blonde British vampire "Spike" on Buffy, shakes all hints of that persona to turn in a low-key, lived-in performance as the fiercely intelligent but somewhat prickly Aldrin. The insertion of garden-variety daddy issues to explain Aldrin's drive is a little pat, but it gives the character (and the actor) some context to work with. Some of the writing is mighty thin, and the inconsistency of the film's narration points to either laziness or unexpected re-editing. The ending is also a touch rushed, though in all fairness, it's not exactly a film that's working towards a suspenseful conclusion; we all pretty much know how this story turns out. Indeed, once they're on the moon, the picture is a bit anticlimactic. In the case of a film like Moonshot, we're more interested in the journey than the destination. Moonshot may lack the high production values and star power of From the Earth to the Moon or Apollo 13, or the deep well of archival materials utilized for films like In The Shadow of the Moon and For All Mankind. But it's a nice kind of hybrid of those genres, ingeniously intermingling drama and documentary to tell a truly fascinating story with skill, if not a tremendous amount of depth. "Moonshot" is available now on DVD. For full A/V and bonus feature details, read this review on DVD Talk.